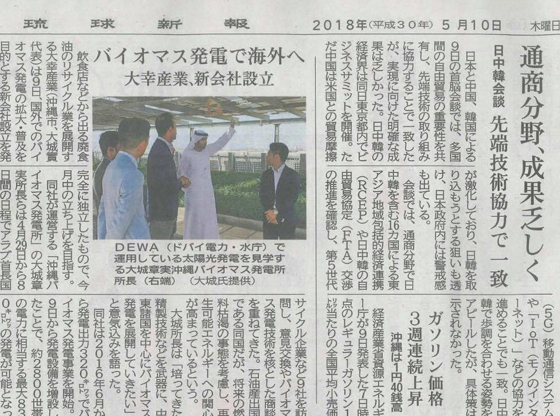 We are pleased to inform that one of our clients from Japan, Daikou Sangyo Co. Ltd., visited UAE to introduce their innovative Used Cooking oil Power Generators. They are promoting Waste to Energy for more than a decade in Japan and now plans to venture overseas with their innovative power generation technique from Used Cooking Oil. They started with Biodiesel production from Used Cooking oil and later developed the Biomass power generator resulting in 100% renewable electricity. They collect used cooking Oil from Restaurants, Households, Food Processing companies, Shopping malls etc. Their purification process is chemical free which reduces the waste and makes it environment-friendly. During their visit to UAE, they visited lot of companies into used cooking oil recycling and promoting waste to energy business. All these companies found this concept of power generation from 100% used cooking oil very interesting and innovative. Copyright NS Trading Co.,Ltd. All Rights Reserved.